We all wear many hats when it comes to running our businesses, but perhaps the most important one for effective branding is that of blogger. Whether you plan to do your own blogging and social media or to outsource the task to a third party, make sure that articulating your brand is a chief consideration with every post you publish. There's another reason I mention hats when it comes to blogging for your business though. A few years ago, when I was still in the newspaper business full-time, I wore a trademark hat, usually an old fashioned stetson in gray, black or brown with thick band and even feathers, giving me the look of a real old-time reporter. 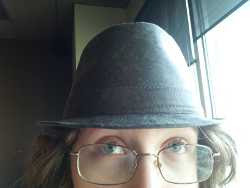 Though I was known for my tenacity in investigative stories and, I like to think, for my balance and fairness too, the fact is that hat was a defining part of my persona, my personal brand, if you will. It opened doors for me by making me quickly recognizable, made it easier for sources and news makers to pick me out in a crowd, and gave me a real definable image in the community where people were used to seeing me regularly. As a result, people began to relate to me as the face of our local paper. As silly as it seems, blogs can have a similar impact on visitors who do not know you, have never met you before, and have no knowledge of your product or service. Spreading the word. Possibly the best reason to have a blog, at least in the short-run, is that it allows you to spread the word about your business, sharing news and information about your products and services. Boosting visibility. Blogging can increase the visibility of your brand on the Internet, particularly through Search Engine Optimization, a way of making your Website more attractive to the major search engines like Google and Bing. Establishing authority. Using your blog to establish your expertise in your industry will further define your brand, raising you above competitors. Building reputation. Your blog will help you build a reputation as a thought leader, preventing you from being considered a mere commodity. Adding differentiation. Blogs can also help set you apart in your market, not only by helping you build reputation but by establishing a style or brand that makes you instantly recognizable. Defining mission. Blogs tell prospective customers or clients not only what you do, but why and how you do it, critical for decision makers when choosing with whom they want to do business. Shaping opinion. Your blog should tell others not only about the work you, do but why it is important and why they should care, showing your passion for your product or service and spreading that enthusiasm to others. Opening doors. Your blog will introduce you to those who share your interests and passions, either as future customers/clients or as possible referral generators. Attraction marketing. Blogs make it easier to teach customers about your product or service and how it will benefit them through free content and examples. Building following. Over time, blogs can help create a community of those who value both you and your product or service, and who will be more likely to buy from you, hire you, or recommend you to friends and business associates. Now that you've heard more about the benefits of having a blog, when are you planning to get started? The tools are freely available and the benefits are huge, so start thinking about creating a blog for your business today! Is Your Blog A Marble Mocha Macchiato?